Emsmorn (often referred to as Emsmorn Bowls) is one of the biggest names in bowls clothing, and accessories, many of which are available through Bowls World. Emsmorn Bowls – click here to buy online our range of bowling bags, clothing and shoes from Emsmorn. Here’s a quick run through of the Emsmorn bowls clothes and bags we supply. 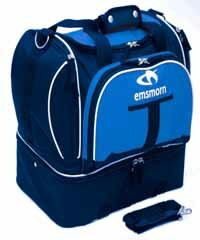 We stock the full range of Emsmorn bowling bags including Mini, Midi and Maxi, Triple Deckers, Flight bags and trolley bags. Emsmorn bowling bags are all luggage quality and made from heavy duty polyester in a range of colours, including red, blue, navy, grey, green, black, cerise and lilac. The bags are fitted with removable Velcro dividers to hold the bowls in place, or supplied with a bowls carrier for convenience. With practicality always in mind, bags are available either with handles or shoulder straps, or in the form of wheeled trolley bags, making getting your bowls and equipment to and from greenside as easy as possible. Skirts: Grey or White, choice of 3 different lengths, sizes 10 to 26. Full length trousers: Grey or White, lengths 27″, 29″, and 31″, sizes 10 to 24. Cropped trousers: Grey or White, 1 leg length, sizes 10 to 22. Zipper jacket: White, knitted collar and cuffs, full length zip and side pockets sizes S to XXL. Blouses: White, sizes 12 to 24. Zippy, Vee and Piquet styles offer a variety of necklines, fastening and pocket options. All clothing is machine washable, 100% polyester for easy care maintenance. Skirts and trousers are Teflon coated to help repel water and stains. Trousers: Teflon coated, with 2 side pockets, one back pocket and a chalk fob pocket, as well as a shirt gripper in the waist band. The grey trousers are in a Bi-stretch material for ease of movement. White or Grey, lengths 29, 31 and 33 inches, waist 30 to 46 inches. Shorts: Teflon coated. White, waist 32 to 42 inches. Shirts: White, sizes S to XXL. Pique and Sportex styles offer different sleeve styles and fabric textures. The Pique is 60% cotton. Pullovers: White, V-neck, Plain or Rib knit, chest 34 to 50 inches. Slip-overs: White, V-neck, Plain or Rib knit, chest 34 to 50 inches. Sweatshirts: White, choice of V-neck or zip-up, sizes S to XXL. Zipper jacket: Alternative to a pullover or an extra layer for chilly evenings. White, full zip, sizes S to XXXL. All items are 100%polyester except for the pullovers and slip-overs which are 100% acrylic and the Pique sports shirt which is 60% cotton, 40% polyester. We stock the Team Windcheater Jacket, The Fleece Jacket, Fleece Waistcoat, Liberty Fleece Jacket, Reversible Gilet, Ventilite Waterproof Suit and Drylite Waterproof Suit. All items are available in white only. Drylite Waterproofs: Fabric – Teflon® coated lightweight polyester outer shell with 2000WP/MVT 100% waterproof & microporous breathable pigmented PU coating, fully lined. Stitch & taped seam construction. Style – concealed hood in storm collar, full length zip with internal placket, raglan sleeve, toggled drawcord hem, adjustable storm cuffs, side seam pockets with zipped closure, wide airflow vented back mesh panel. Sizes – XS/34, S/36-38, M/38-40, L/40-42, XL/42-44, XXL/44-46. Ventilite Waterproofs: Fabric – bright white Teflon® coated, soft feel, 2oz polyester outer shell with new 5000WP/MVT 100% waterproof & microporous breathable pigmented PU coating. Stitched & taped seams, fully lined. Style – concealed hood in storm collar, toggled drawcord hem, adjustable storm cuffs, 2 front pockets withÂ rain flaps & stud fastening, wide airflow vented back mesh panel, full length zip with internal placket. Sizes – XS/36, S/38, M/40, L/43, XL/45, XXL/47, XXXL/50. Fleece Waistcoat: Fabric – bright white heavyweight 320gm2 anti-pill dense polyester fleece. Style – unisex, full length front zip, sleeveless, 2 zipped jet pockets and adjustable toggle drawcord hem. Sizes â€“ S/38, M/40, L/42, XL/44, XXL/46 (generous fit). Ladies Liberty Fleece Jacket: Fabric – bright white heavyweight 280gm2 anti-pill dense polyester fleece. Style – ladies shaped, full length front zip, raglan sleeve design, 2 zipped jet pockets, adjustable toggle drawcord hem, feminine fit. Sizes â€“ XS/34, S/36, M/38, L/40, XL/42. Fleece Jacket: Fabric – bright white heavyweight 320gm2 anti-pill dense polyester fleece. Style – unisex, full length front zip, raglan sleeve design, 2 zipped jet pockets and adjustable toggle drawcord hem. Sizes – S/36-38, M/38-40, L/40-42, XL/42-44, XXL/46-48 (generous fit). Fleece Gilet: Fabric – bright white Teflon® coated showerproof polyester Microfibre outer shell, fleece on inner side. Style – snug fitting reversible style bodywarmer with full length zip, padded mandarin collar, outer zip placket, vertical front pockets set into seams, kidney warmer back shape. Sizes – S/36, M/38-40, L/40-42, XL/42-44, XXL/44-46. Team Jacket: Fabric – Teflon® coated showerproof & windproof polyester Microfibre outer shell, fleece lined body. Style – modern bomber jacket with full length zipper into storm collar, raglan sleeve, zipped jet pockets, adjustable cuff, rouched elasticated hem, silver grey piping in front & back seam of body & sleeve. Sizes â€“ XS/36, S/38, M/40, L/42, XL/44, XXL/46. We stock the Emsmorn Harmony and Libra Freestyle shoes for women. Both styles offer wider fitting and are exceptionally comfortable and supportive while being lightweight and flexible. Harmony: Uppers – ultra soft nappa leather. Inner Sole – anti-fungal contoured midsole. Outsole – conventional EVA sole. White or Grey. Sizes 4 to 8. Libra Freestyle: Uppers – super soft water repellent nappa leather. Inner Sole – anti-shock heel set in contoured midsole and anti-fungal liner. Outsole – PU sole slip is flexible, hear-wearing and offers essential grip on all surfaces in both dry and wet conditions. Fitted with a half size girth adjustment to ensure a correct fit for both feet.White or Grey, Sizes 4 to 8. Quantum Freestyle: Ultra soft napa leather upper. Anti-fungal contoured midsole. Conventional EVA sole. White, Grey or Tan. Sizes 7 to 11. Capricorn Freestyle: Super soft water repellent napa leather upper. Anti-shock heel set in contoured midsole. Slip resistant PU sole sculptured for safety and appearance. White or Grey. Sizes 7 to 11. Taurus Freestyle: Super soft water repellent napa leather upper. Anti-shock heel set in contoured midsole. Slip resistant PU sole sculptured for safety and appearance. White, Grey or Tan. Sizes 7 to 12. Premier Freestyle: Super soft water repellent napa leather upper. Anti-fungal contoured midsole. Conventional EVA sole. Velcro fastening for ease and convenience. White or Grey. Sizes 7 to 11. Result: Uppers – super soft water repellent nappa leather. 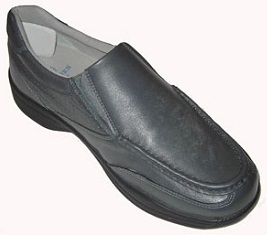 Inner Sole – anti-fungal contoured midsole. Outsole – conventional EVA sole. White, Grey or Tan. Sizes 7 to 12. All the Emsmorn Freestyle models offer a wider fitting and are exceptionally comfortable and supportive, light weight and flexible. A half size girth adjustment ensures a correct fit for both feet, while an anti-fungal inner sole liner for odour reduction. The flexible hard wearing PU sole offers essential grip on all surfaces in both dry and wet conditions. Good headgear is essential for any outdoor sport and bowls is no exception. Being able to keep the sun and rain off isn’t just a matter of comfort, it can greatly affect your playing performance. Emsmorn supply a great range of headwear for ladies and men to handle whatever the British weather has to offer. All Emsmorn headwear is available in white only. Ventilite Rain Cap: Fabric – bright white as Ventilite suits, Teflon® coated, soft feel, 2oz polyester outer shell with new 5000WP/MVT 100% waterproof and microporous breathable pigmented PU coating. Stitched & lined with breathable membrane. Lightweight breathable waterproofness for comfort, matches Ventilite wet suits. Style – flat “cheesecutter” cap with single stud on stiffened large peak, part elasticated crown and fully lined. Large peak provides ideal protection for bespectacled bowlers. Sizes – one size fits all, elasticated brim. Knitted Flat Cap: Fabric – 80/20 polyester polyethylene. Style – Kangol® type flat cap with vented knit construction and broad peak. Sizes – M/58cms, L/59cms, XL/60cms. Curly Sun Visor: Fabric – 100% cotton. Style – Alice band style with towelling facing, large visor has green underside to minimise light reflected into the eye, and discreet Emsmorn embroidered logo. Size – one size, adjustable through curly “kettle lead” fitting. Clip On Sun Visor: Fabric – 100% cotton. Style – Alice band with padded grip and large curved peak with Emsmorn logo on side. Size – one size fits all. 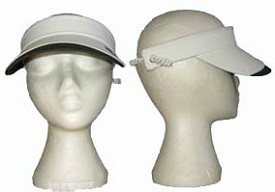 Sun Visor Adjustable: Fabric – 100% cotton. Style – large curved peak with green underside, Velcro adjustable fit. Size – one size fits all. Baseball Style Cap: Cotton baseball style cap with large formed peak and adjustable fitting. Rainproof Baseball Cap: 100% bright white cotton with Teflon® coating, showerproof performance. Style – large formed peak with green underside, new Emsmorn logo on adjustable tab. Sizes – one size fits all. Ventilite Rain Hats: Fabric – Bright white as Ventilite suits, Teflon® coated, soft feel, 2oz polyester outer shell with new 5000WP/MVT 100% waterproof & microporous breathable pigmented PU coating. Stitched & fully lined with breathable membrane. Style – domed hat with lightly padded and stitched wide brim, crown band, elasticated crown grip. Sizes – Medium / 58cms & Large / 60cms. Emsmorn Ltd has been a major brand of bowls clothing and accessories since it was established in 1978. They pride themselves on designing with the bowler in mind and basing their products on customer feedback, earning themselves a reputation for innovation, practicality and comfort. Emsmorn offers an extensive range of men’s and ladies bowls clothing, including outerwear, weatherwear and shoes in a large range of sizes and styles. They are suppliers of the famous Ventilite and Drilite brands of fabric, offering high performance breathable waterproof clothing and headgear. And they have put the same level of innovation into their footwear. Emsmorn bowls shoes for men and ladies focus on practical comfort with the emphasis on comfort and flexibility. For example, the new but already popular Freestyle range includes innovative half size girth adjustment, ensuring a perfect fit for both feet, or the ability to expand in hot weather. Emsmorn is also well known for its range of luggage quality bowls bags in just about any size and a good range of modern colours.